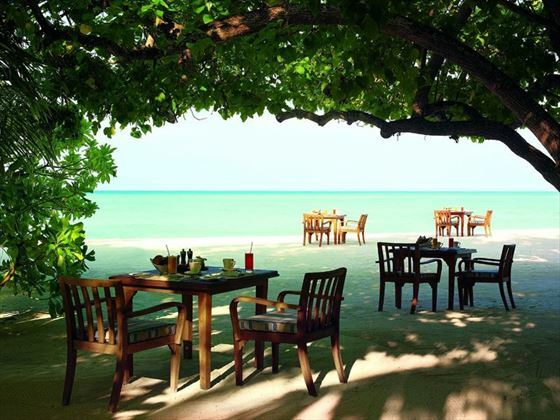 Blessed with outstanding surrounding beauty in the form of vast clear blue waters, the Taj Exotica Resort & Spa is an idyllic spot in the heart of the Maldives. 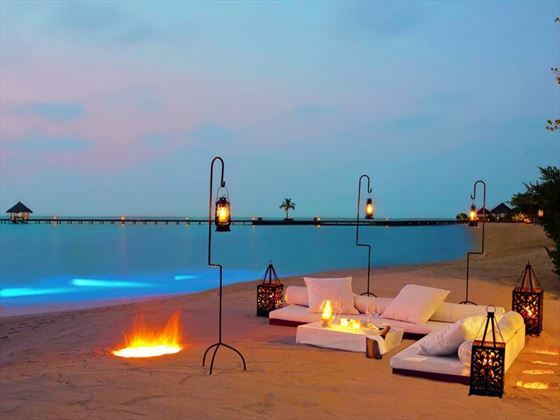 Boasting 64 palm-thatched villas, you’ll experience a new level of luxury here – this resort offers exclusivity and a tranquil environment that’s second to none. 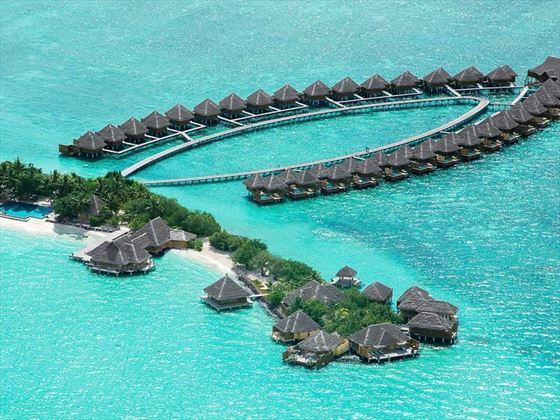 If you’re looking to explore outside of your villa you can take advantage of the resort’s experiences, such as a seaplane flight over the coral reefs of the Maldives, or a sunset cruise around the island. 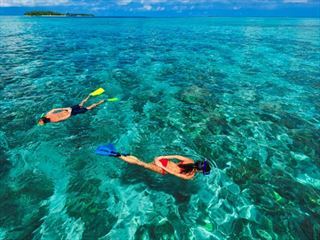 We think the choice of watersports here is fantastic, so why not explore the exotic marine life with a diving or snorkeling trip? There’s also a freshwater infinity pool, a fitness center and a choice of sports on offer to keep you entertained. With a butler service, you needn’t worry about any stress on your vacation – everything from booking scuba diving excursions to adjusting the lighting and temperature levels in your room can be arranged to suit you. 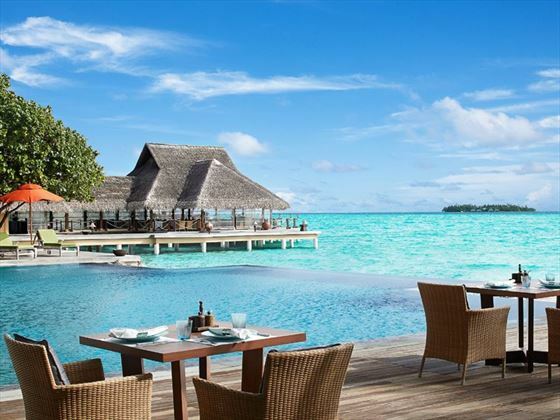 The dining options here are excellent, with four restaurants and bars to choose from, each providing gourmet dishes with exceptional surrounding views. 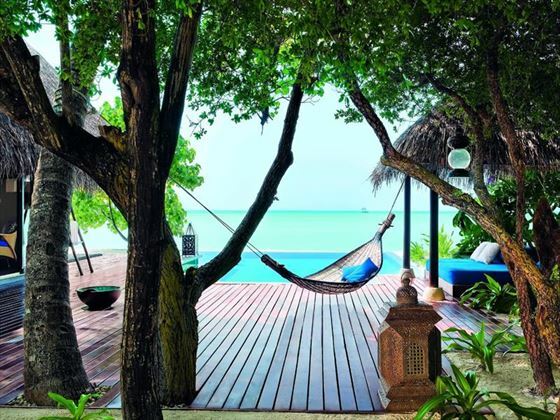 This beautiful retreat nestled on the remote Emboodhu Finolhu Island is the epitome of tranquillity, where you can acclimatise to ‘Taj Time’ and spend your days truly unwinding. 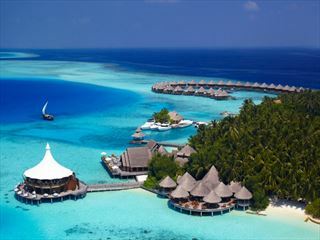 Based on the beautiful island of Emboodhu Finolhu, the resort is found in the south Male Atoll in the Maldives. Known as the Three Coconut Isle, you’ll be surrounded by beautiful coral reefs. 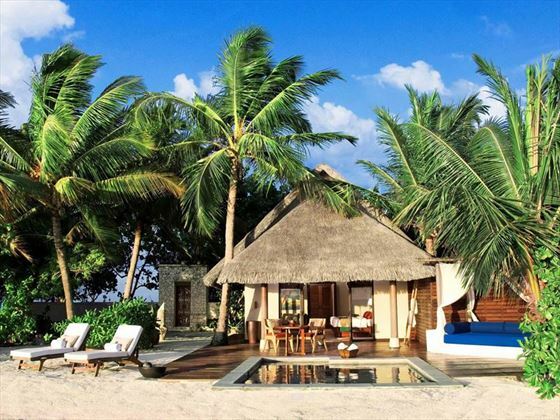 The resort offers 62 villas, each designed in traditional Maldivian style with luxurious décor. 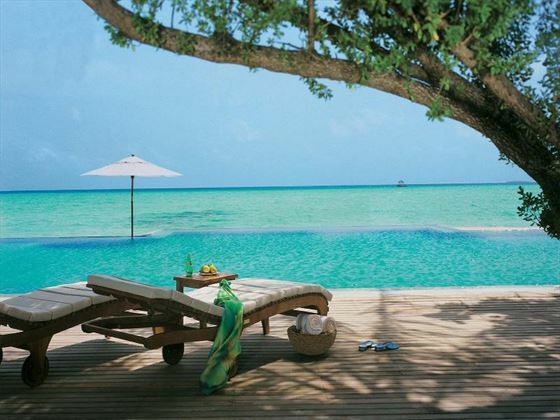 Lagoon Villa Ocean View - Located just a few steps away from the lagoon, these gorgeous 71sqm villas showcase sweeping vistas across the Indian Ocean. Accommodates up to three guests. Premium Villa - Featuring an exclusive private outdoor area, these modern and luxurious 200sqm villas are appointed with a luxurious selection of amenities including a private beach area, an outdoor shower and a plunge pool. Accommodates up to three guests. 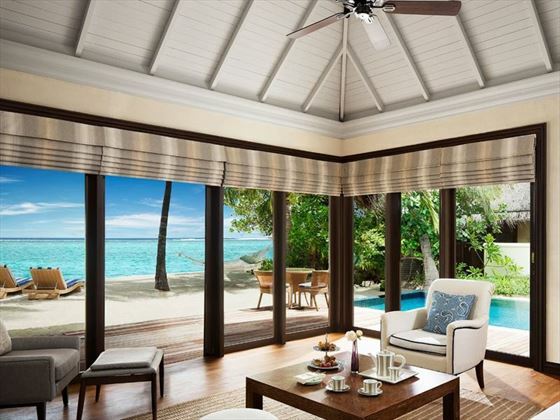 Deluxe Beach Villa - Set upon the silky white sand of the beach, these extravagant 165sqm villas are just steps away from the clear, azure lagoon, boasting an oversized plunge pool and daybeds on the private terrace. Accommodates up to three guests. One-Bedroom Ocean Suite - Showcasing stunning ocean views from every corner, these magnificent 195sqm suites are separated over an elegantly-designed bedroom, a glass-walled bathroom, a sala-style dining room and a spacious, separate living room. Accommodates up to three adults and two children. 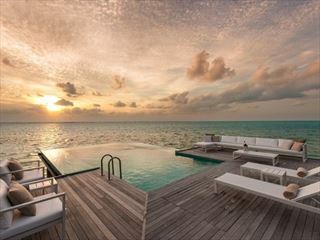 Deluxe Lagoon Villa - Perched on stilts above the turquoise lagoon, these rustic 94sqm villas boast unsurpassable views of the lagoon and the horizon from the private overwater sundeck fit with plunge pool and daybed. Sleeps up to three guests. 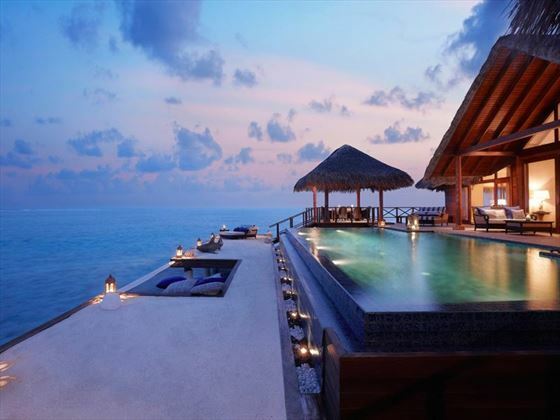 One Bedroom Beach Villa Suite Pool - These lavish 270sqm villas are tucked away just five metres from the azure lagoon, boasting sensational sunset views, a living room and sala-style dining room, a sunset balcony, and a sundeck with plunge pool and daybed. Sleeps up to three guests. Two Bedroom Beach Villa Suite - Stunning two-bedroom 365sqm villas ideal for families, featuring the standard amenities and glorious ocean views, as well as a private balcony in the main bedroom, a living room and sala dining room, a spa treatment room with a sundeck with a plunge pool. Sleeps up to six guests. Rehendi Presidential Suite - A truly opulent 500sqm overwater suite, sitting above the translucent lagoon and featuring plenty of first-class, relaxing amenities inclduing a living room, two sala-style dining rooms, a private deck with a 18m pool and overwater hammock, and a private balcony in the main bedroom. Sleeps up to six guests. Equator Bar - A sophisticated bar with a thatched roof and sunset views, featuring a menu brimming with decadent wines, cocktails, shishas and cigars. Open 4pm-12am.